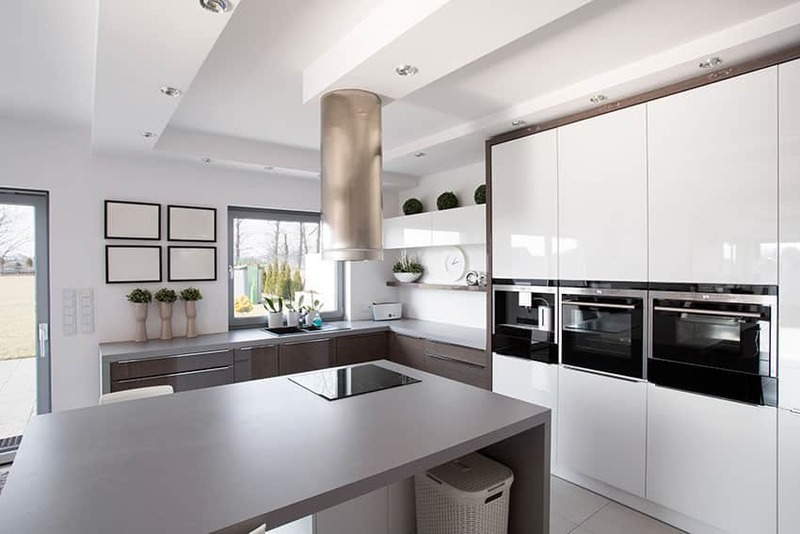 This gallery showcases modern white kitchen design ideas with both style and functionality. 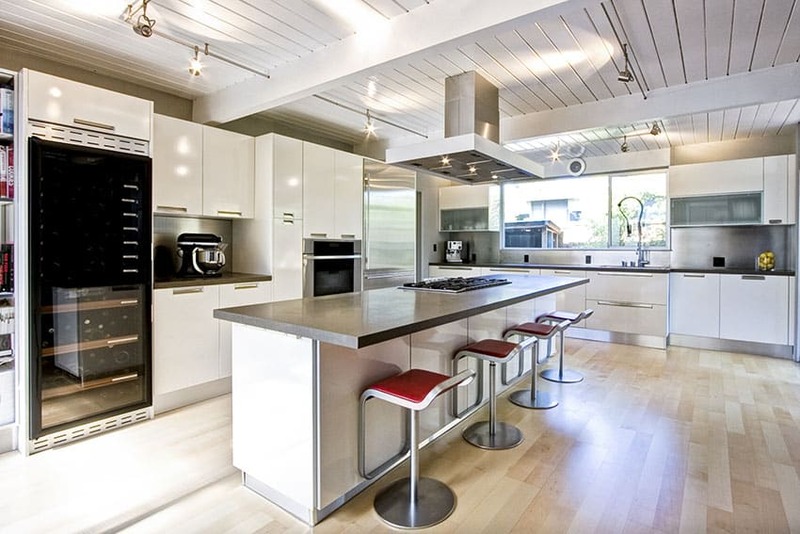 White is a popular color for modern kitchens since it can be matched with anything, and looks stunning. Not only does white help make the kitchen look larger it’s often used in modernist interior design due to its timeless beauty. Here are some modern kitchen designs with a variety of different cabinets, islands, tables, backsplash and appliances so you can find the exact style you love the best. The modern style kitchen in the image above features white cabinets and cupboards, prominent in front of a diamond-tiled metal backsplash. Clear glass and metal are used as accents to the white walls and dark wooden hardwood floors, seen in the “Ghost” barstools and chrome-finished round pendant lights, and matched by the clear glass and stainless steel wine chiller, as well as the clear glass and metal balcony for the stairs to the side. 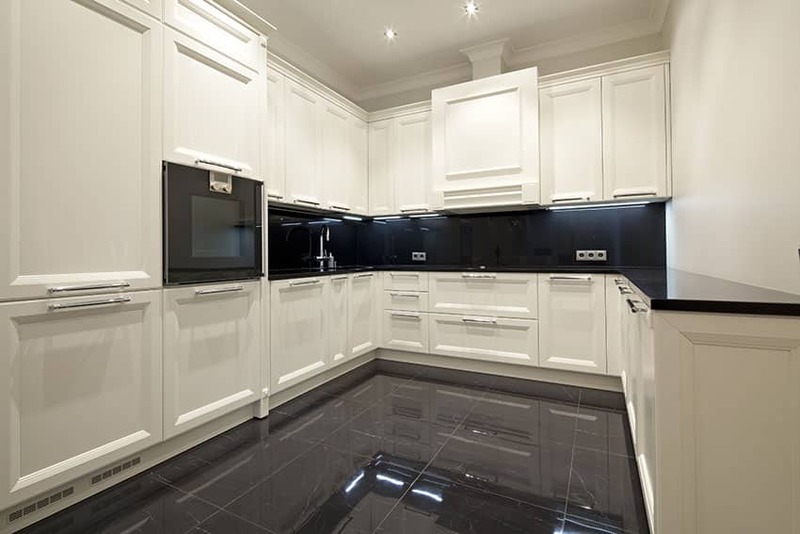 Modern white cabinets feature sleek horizontal lines and flat surfaces to give a distinctly modern impression. 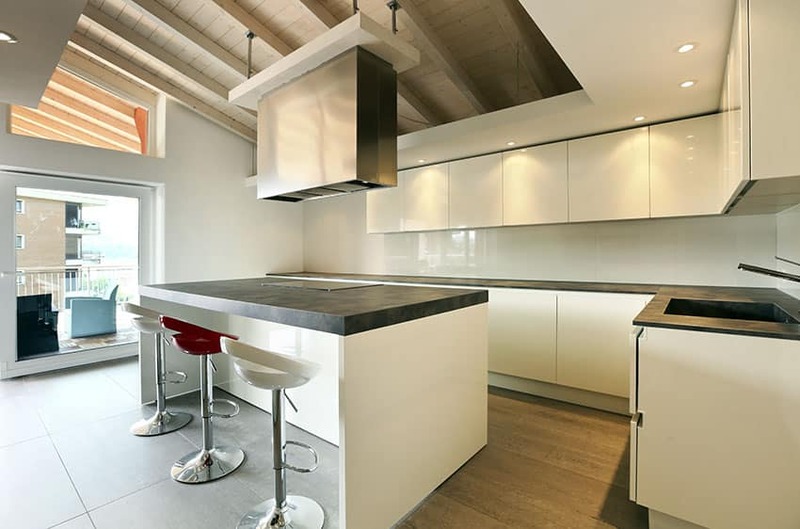 With emphasis on style and a minimalist design a modern kitchen keeps things simple and stylish. Kitchen cabinets used typically have flat panel or slab style doors with no frame. The cabinetry is often a full-overlay or frameless construction with doors covering the face of the cabinets completely. Keeping the modern style consistent is important with hardware as well which are made of stainless steel, chrome, aluminum or other metal materials. 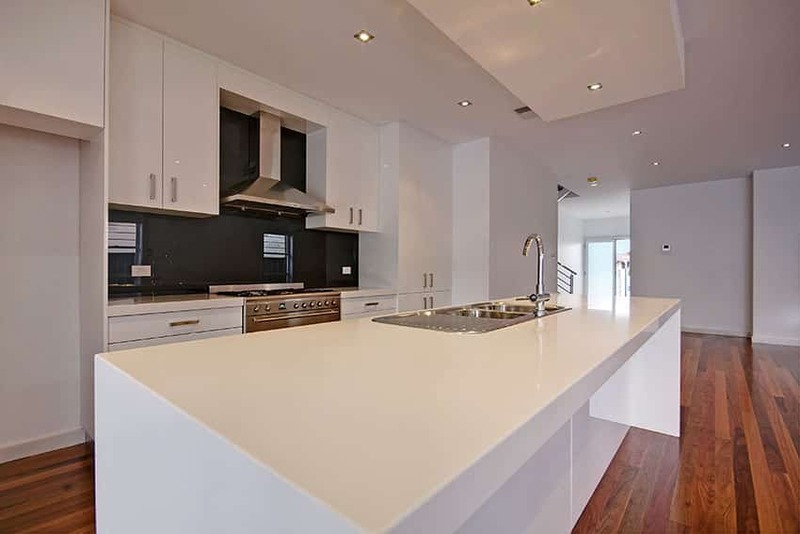 This all white kitchen features not only white ceilings and walls, but glossy white seamless cabinets. White-toned finishes also guide this modern design with pale wood laminate flooring and Carrara marble countertops for the breakfast bar and backsplash. Cool tones add to this modern kitchen design style with cool white downlights and pelmet lighting, as well as chrome-finished barstools, range hood and appliances. This contemporary kitchen features rustic warm wood flooring and a trio of bell jar pendant lamps hanging over the kitchen island. 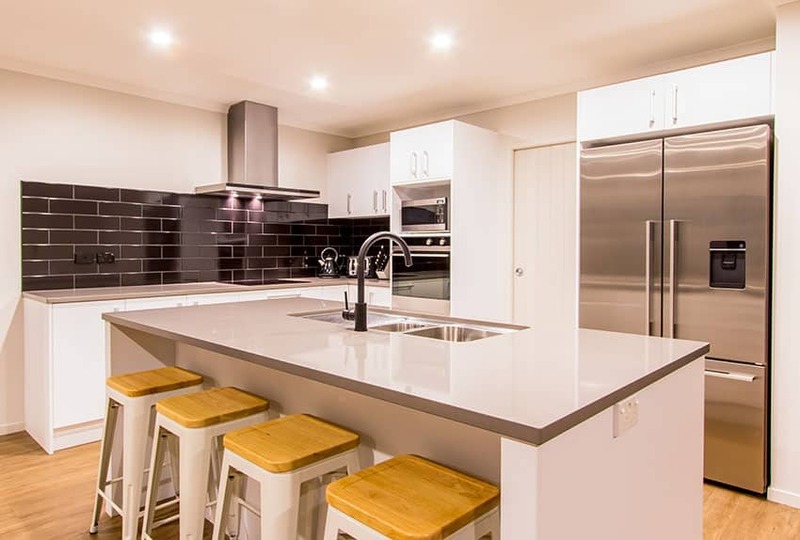 Glossy white and black seamless cabinets and drawers add to the modernity of the kitchen, as do the chrome-finished barstools and kitchen appliances and glass backsplash. Some rustic-modern touches include the wide Calacatta marble island countertop and black framed picture window leading to the patio. The almost futuristic feel of this kitchen is brought on by the solid wall of glossy white cabinetry with Miele built-in appliances in stainless steel finish. 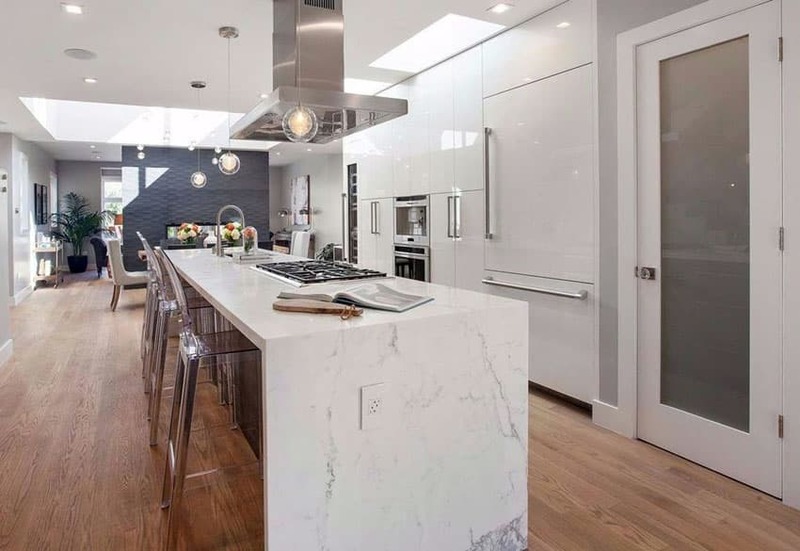 The modern kitchen island also features a streamlined modern profile, but comes with a more organic Calacatta marble waterfall countertop that continues down to its sides. A trio of hanging orbs illuminates the kitchen island while the skylight illuminates the rear of the kitchen. Warm wood flooring ties together the whole look and softens this modern kitchen. Lending this living area a very spacious look, the whole kitchen was recessed and lined up on one wall, featuring the pantry neatly hidden behind the casework wall. White flush cabinets and drawers with minimal hardware dominate the wall space, broken only by the white quartz countertop and stainless steel stove top, range hood and wash basin. Birch wood floors running along this industrial residence add warmth to the white and chrome finishes of the kitchen nook. 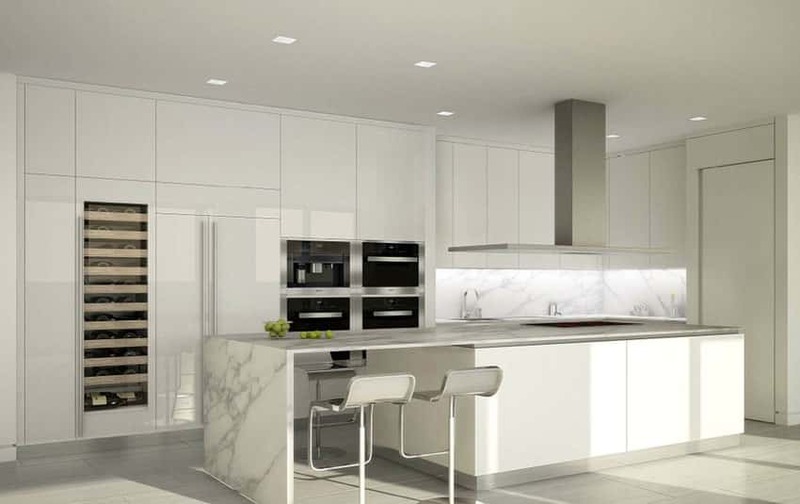 This Contemporary chic kitchen features glossy all-white ceilings and cabinets. White is also the chosen color for its quartz countertops, complemented by chrome-finished wash basin fixtures, barstool bases and hanging colander lamps. A study in contrast, the kitchen’s back wall features matte black cabinets and a bronzed backsplash, while the floors are in painted black concrete. An arrangement of three Edison lamp pendants in varying glass bell jar shapes hangs on black wire and mount above the marble countertop that seamlessly continutes onto its sides. 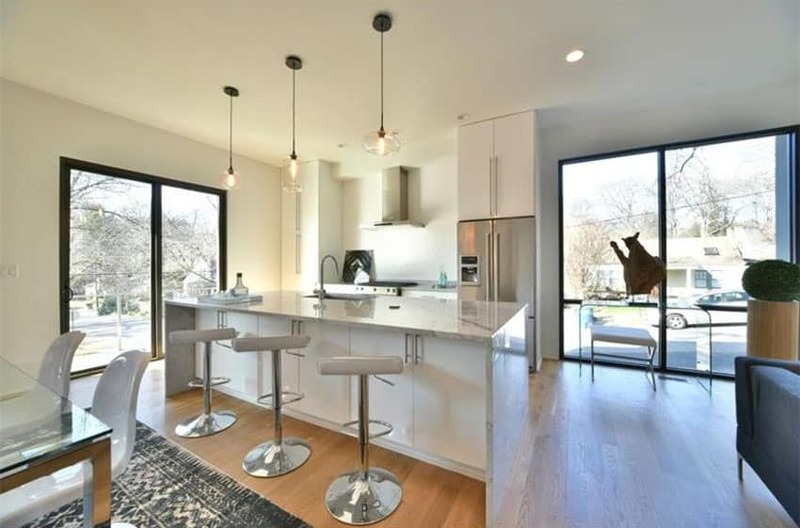 White cabinets are outfitted with long, vertical chrome-finished handles that match with the stainless steel appliances and adjustable bar stools. Warm wooden plank flooring gives a more natural feel to the modern kitchen, as do the two large sliding doors on either side of the kitchen. A beautiful three-section picture window overlooking apartment blocks is framed by flushed casework and appliances in minimal white and embedded chrome hardware on either side of it. The centerpiece of this kitchen is the island, where a trio of orb pendants hang over the brown stone countertops that continue until its sides. The darkness of the stone is also echoed on the kitchen’s backsplash, as well as on the dark wood used for this modern kitchen’s flooring. 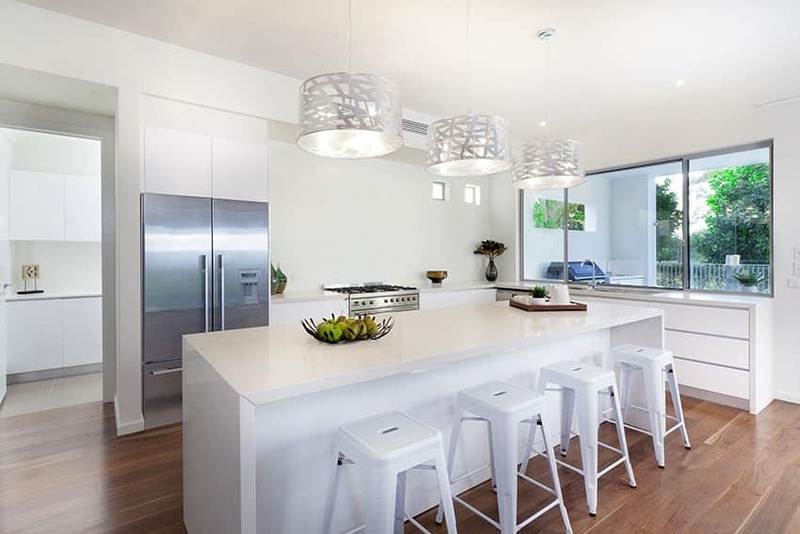 An all-white modern kitchen with its polished cabinets and casework is accompanied by white ceilings, white walls, white barstools and a white quartz countertop. Topping the kitchen island are a trio of silver drum pendant lamps, matching with the stainless steel refrigerator and stove top. The warm brown wood flooring and large picture window to the side bring in a more natural feel to this Contemporary kitchen. A beadboard ceiling with exposed white painted floor beams support track lights that illuminate this modern cottage style kitchen. While the ceiling speaks of more rustic beginnings, the glossy white flushed cabinets and drawers are decked in modern minimal chrome-finished hardware and go with the flushed stainless steel and glass appliances. Natural finishes such as the grey marble countertop and light wood strip flooring add to the cottage style vibe of this L-shaped kitchen and its center island. 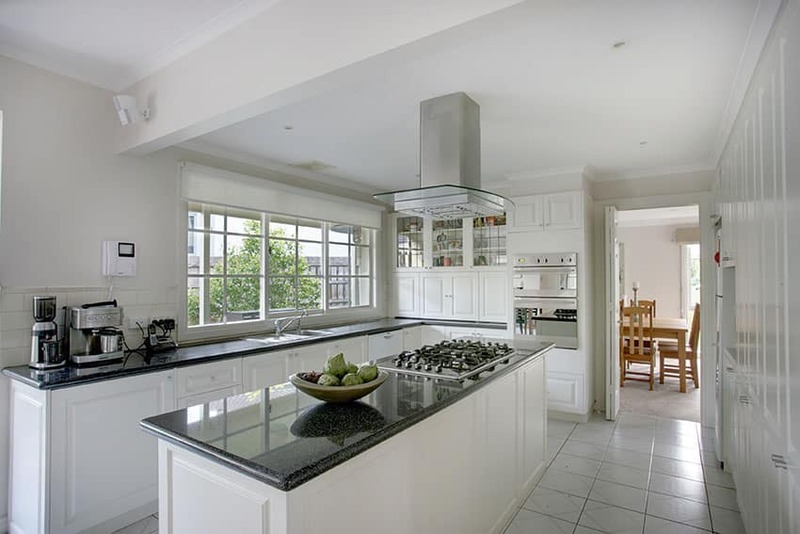 A simple L-shaped kitchen is rendered larger by the long horizontal mirror with black frame on the wall opposite. Glossy white cabinets feature no handles and allow the chrome-finished appliances to be perfectly flushed with their surfaces. A black stone countertop contrasts with the whit casework and the black, white and steel theme is also reflected in the small dining set. Greyish wooden flooring matched with a red area rug add a pop of color to this minimalist kitchen. Modern white kitchen design ideas are trending nowadays to bring in pops of color in bold ways such as the dramatic red rug shown in the picture above. Ths tropical modern kitchen features slanting beadboard and exposed beam ceilings matched with a cove ceiling and downlights illuminating the flushed high gloss white lacquer cabinets. A white tile backsplash matches the light colors used in this tropical modern kitchen and is offset by the black soapstone countertops with their unfinished, matte texture. A hanging range hood also adds to the tropical modern vibe, as does the hardwood plank flooring. 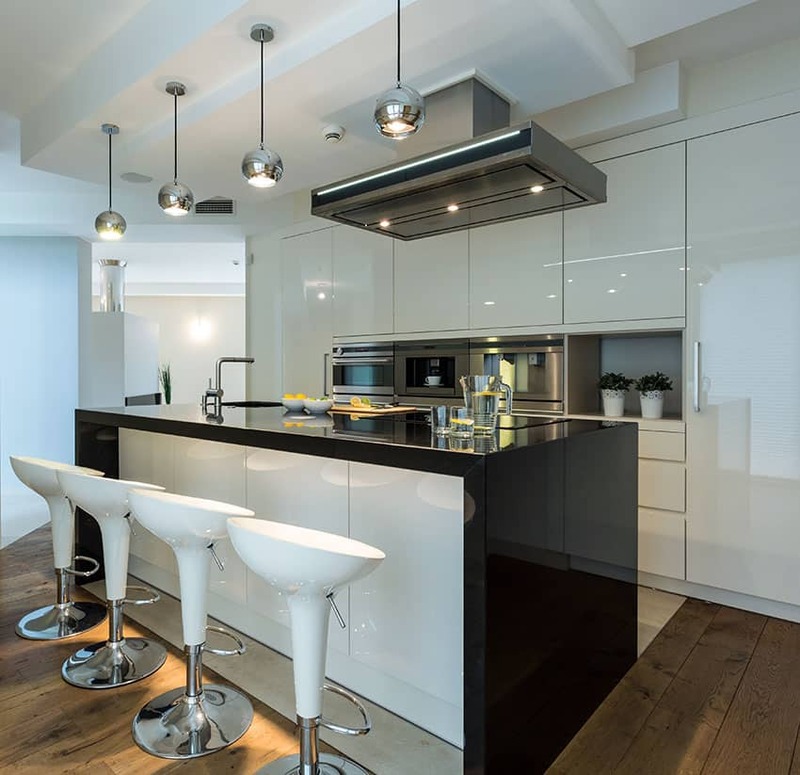 This chic Contemporary kitchen features a while wall of floor-to-ceiling glossy white cabinetry with seamlessly embedded black and stainless steel appliances. 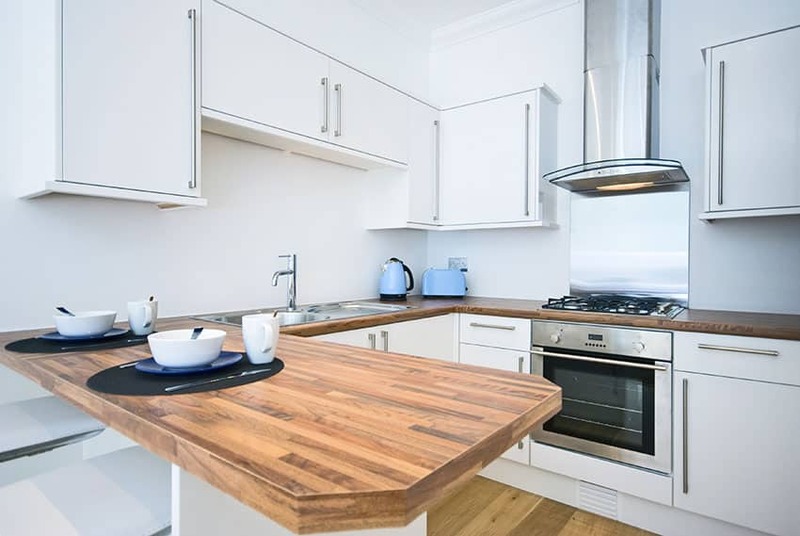 The rest of the kitchen also features glossy white cabinets matched with grey wood laminate undercounter drawers. More rustic elements include the solid grey countertop for the island and the brass-like finish of the circular range hood. This modern kitchen island features glossy white finished undercounter cabinets and drawers with no external hardware, a black metal wash basin and a black electric stove top topped with a glass and stainless steel range hood. 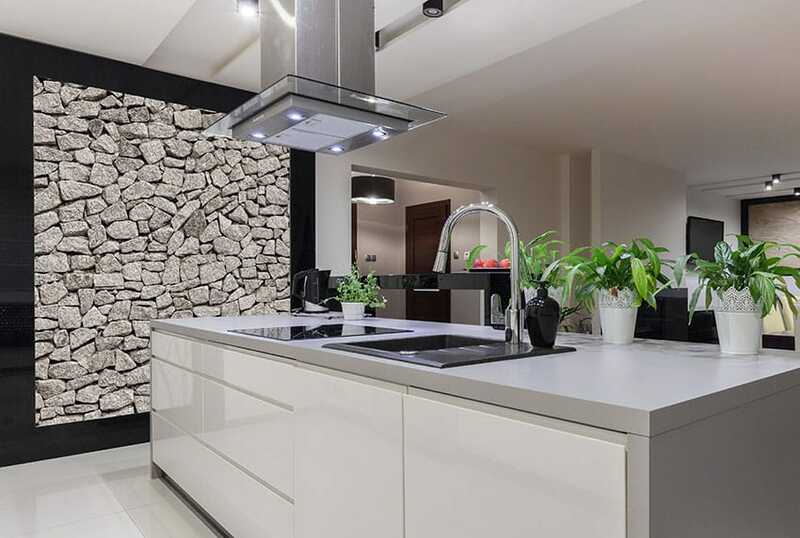 The back wall in stacked stone with a black border serves as an interestingly rustic accent wall to this very modern minimalist kitchen setting. This modern luxe kitchen features luxurious elements in the frescoes on its column and the fancy lampshade chandelier over the double-layer kitchen island. 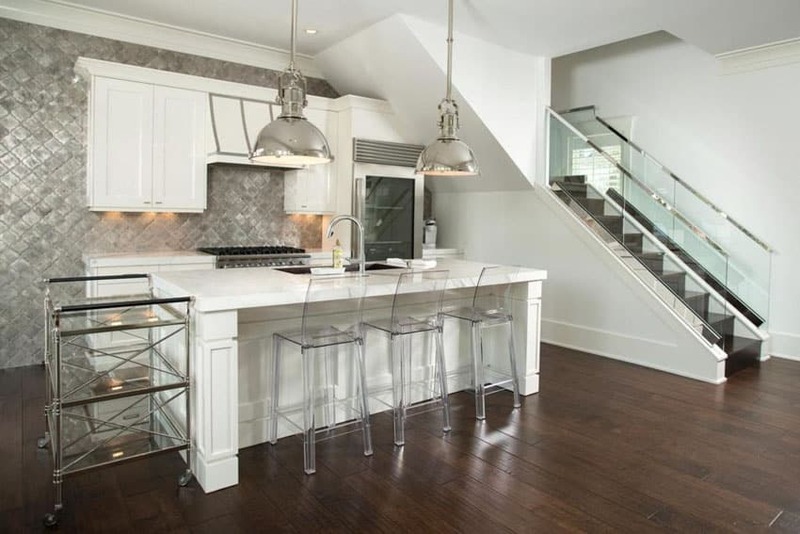 The kitchen island features a white quartz countertop on a white high gloss body, and an extra wood finished serving platform on the edge of the island. The white high gloss finish is continued on the flushed cabinets on the kitchens back wall, complemented by stainless steel appliances and white backsplash. 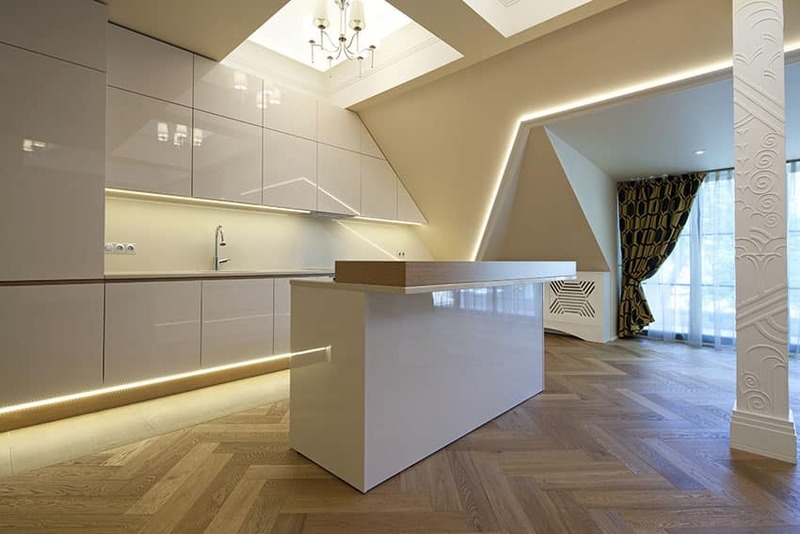 The outlines of the kitchen’s plinth and pelmet as well as the architrave’s framing is highlighted with strip lighting, giving this kitchen a futuristic feel. 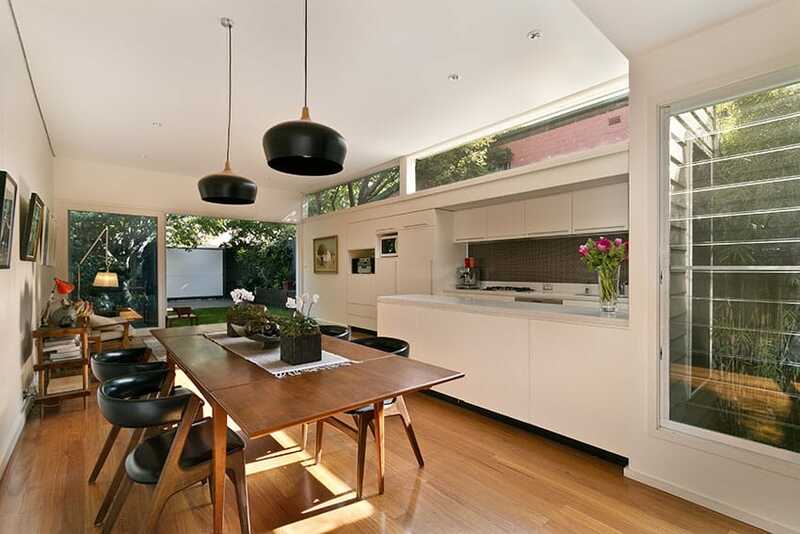 The pair of skylights on the ceiling also add light to this modern luxe kitchen. This modern black and white kitchen features flushed glossy white cabinets and drawers in thin horizontal sections with wide polished chrome handles. 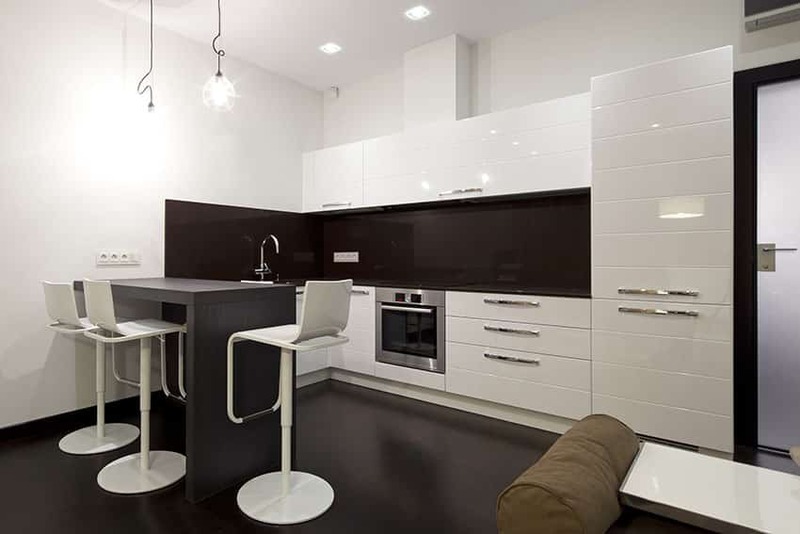 The all-white walls are broken only by the black graphicote glass backsplash, which is echoed by the black matte flooring. A simple breakfast bar for three features a linear projection from the wall in a matte grey wood frame matched with classic white barstools. This dining table and kitchen features a lot of natural light with its jalousie windows and transoms over the kitchen back wall. More natural finishes also figure into the design, with a warm wooden dining table with matching wooden chairs and black upholstery, and complementary warm wood plank flooring. White walls eagerly welcome matte white kitchen cabinets and casework and the white quartz countertops. The white backwall of the kitchen is broken only by the net-patterned tile backsplash. A pair of black metal pendants hang over the main dining table and provide a great accent piece to this natural modern kitchen. This Contemporary rustic kitchen features white walls, ceiling and trim, as well as matte white cabinets matched with matte chrome-finished handles in a long, linear profile. The metallic finish of the stainless steel stove top, range hood and wash basin is complemented by the butcher block wood countertops. A lighter more yellow-toned wood plank flooring ties together the whole kitchen. Four small metallic orb pendant lamps hang over this ultra modern kitchen’s polished black quartz countertop kitchen island with glossy white undercounter cabinets. 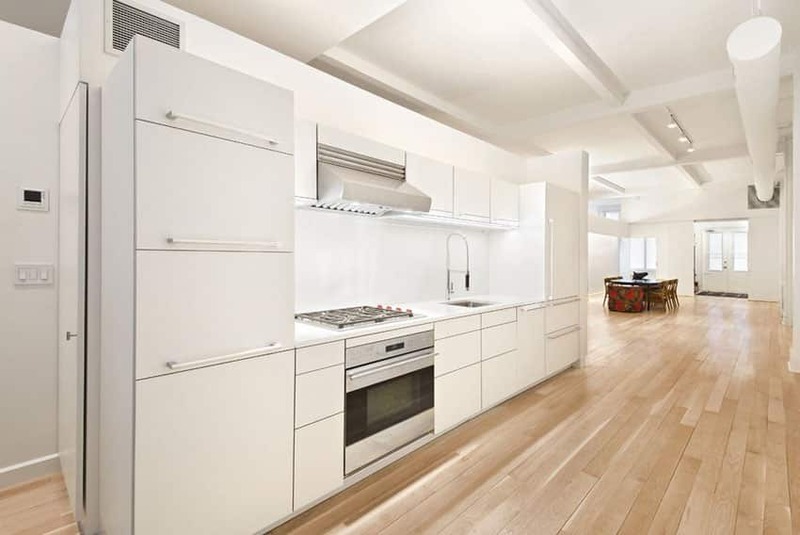 The glossy white finished is continued in the plain profile of the kitchen back wall with recessed chrome-finished kitchen appliances and a small decorative nook. The large dark metal range hood mounted onto the ceiling adds to the ultra modern look of this kitchen, while the cool brown plank flooring complements the black, white and metal scheme. See more small modern kitchen ideas here. This all white kitchen’s walls is broken only by the black subway tile backsplash used on the backwall, complementary to the glossy grey laminate kitchen countertops used. White flushed cabinets and drawers feature chrome-finished appliances recessed into the casework, while warm wood accents are used as elements in this modern kitchen’s bar stools and wood plank flooring. 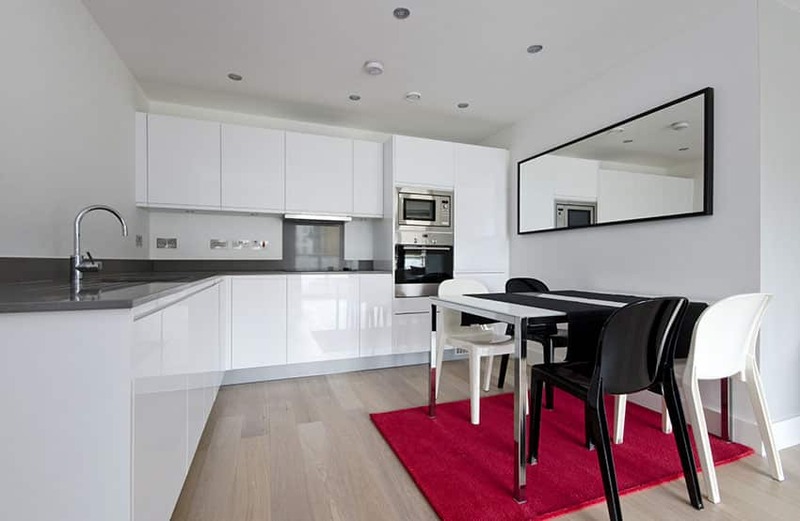 This modern kitchen’s high gloss white cabinets in a plain profile go well with the chunky silver handles used. Adding to the theme of lightness in this kitchen’s color scheme, a white quartz countertop is prepared for a polished stainless steel sink, and is mirrored by the drop ceiling above it. The white walls and casework feature the stainless steel stove top and range hood as its centerpiece with a black glass backsplash as its base. The whole look is completed by the reddish brown wood plank flooring. This Contemporary rustic kitchen features glossy all-white cabinets and drawers, albeit with a flushed panel design. The long center island is outfitted with a surface-mounted stove top and hanging range hood in stainless steel and glass. The classic look of the white ceramic tiles, paneled cabinets and white mullioned windows are complemented by the black granite countertops to provide a more modern element in this traditional style kitchen. 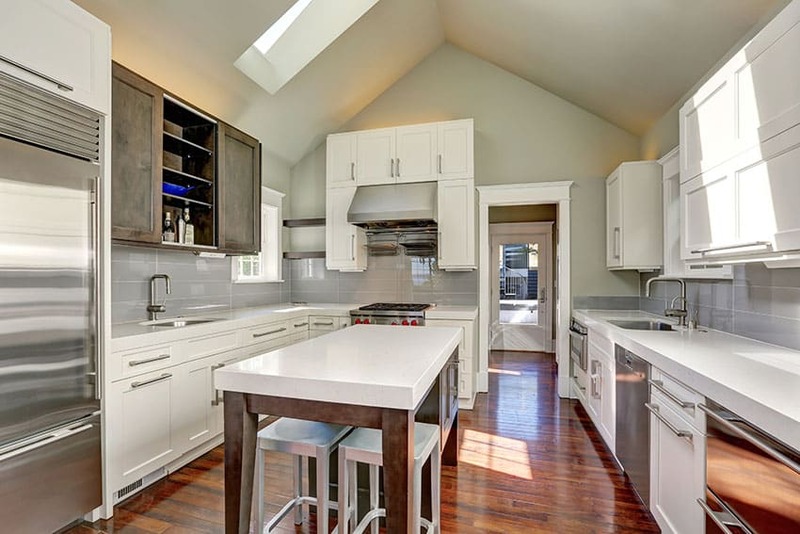 See more pictures of white kitchen cabinets with granite countertops here. This modern U-shaped kitchen features paneled white cabinets and drawers with long horizontal door pulls and black metal and glass appliances embedded into its casework body. White walls, trims and ceilings are offset by the black glass backsplash, polished black quartz countertops and polished black porcelain tile flooring. All in all, giving this black and white kitchen a modern twist while sticking to classic elements. The cottage style element of the cathedral ceiling is made modern by smoothening it out with ceiling boards and installing a roof skylight. Modern elements exist in the white paneled cabinetry and minimalistic chrome-finished hardware, as well as the stainless steel wash basins and appliances flushed into the casework body. White quartz countertops and a pale grey tile backsplash also add to its modernity, and is complemented by the scrubbed grey wood sliding door cabinet on the left, as well as the reddish-strip wood parquet flooring. 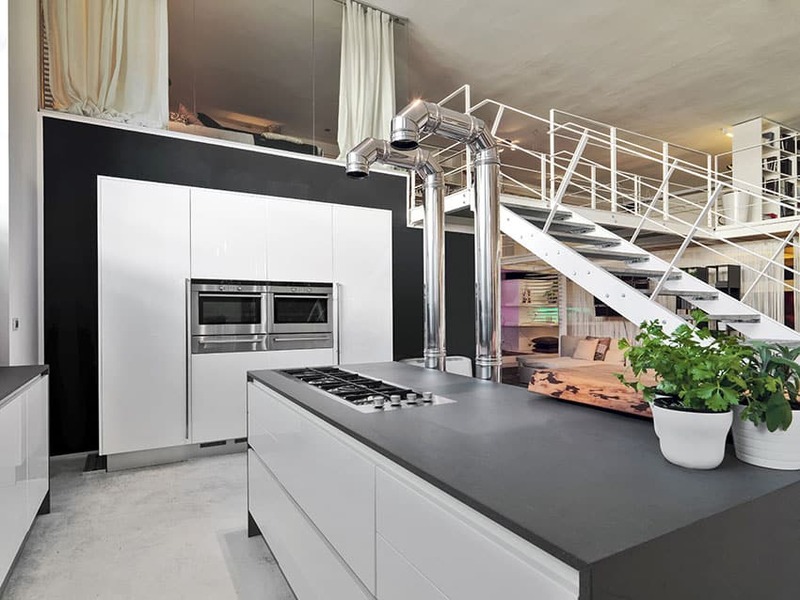 This loft apartment’s kitchen features a lot of character with the industrial elements brought about by its white steel stringer and railing stairs and the pair of polished chrome exhaust pipes hanging over the stove top recessed into the grey soapstone countertop. Below the picture window with curtains leading to the loft’s bedroom is a solid floor to ceiling wall of white cabinets with long, linear door pulls with a pair of stainless ovens embedded into its casework. The whole set is embossed upon a matte black background which also features a small set of shelves on the side, next to the quirky living area under the stairs. 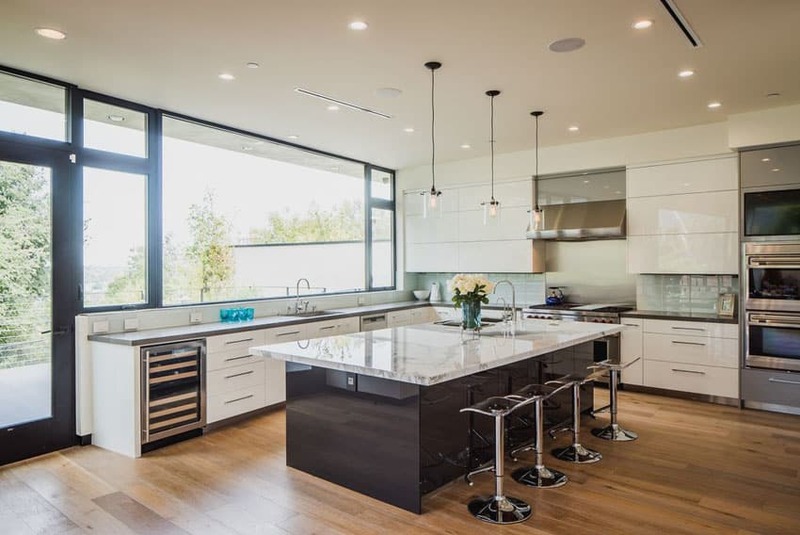 This ultra minimalist galley-style kitchen features a lot of clean lines and solid tones, starting with the blank white cabinets and drawers, as well as the passage of floor to ceiling casework with embedded stainless steel and glass appliances. 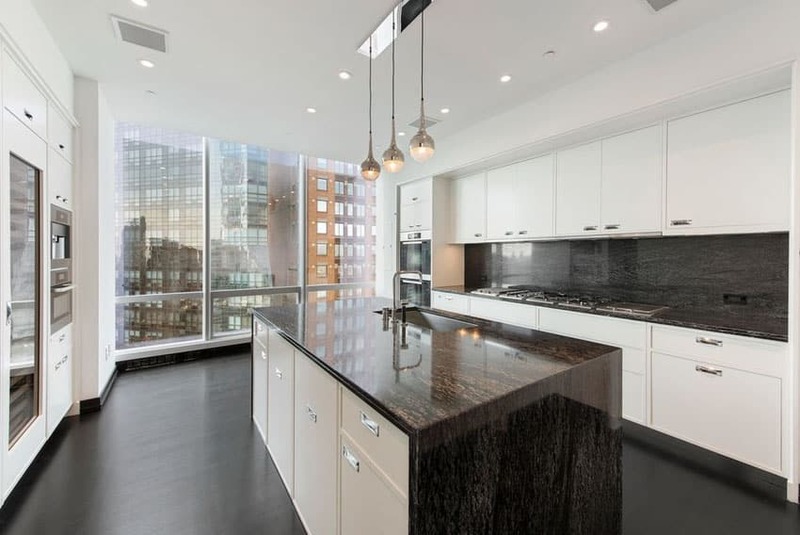 The horizontal set of picture windows on the backwall is framed by white quartz countertops below it and a white drop ceiling above, culminating in a tubular range hood over the counter-embedded stove top. 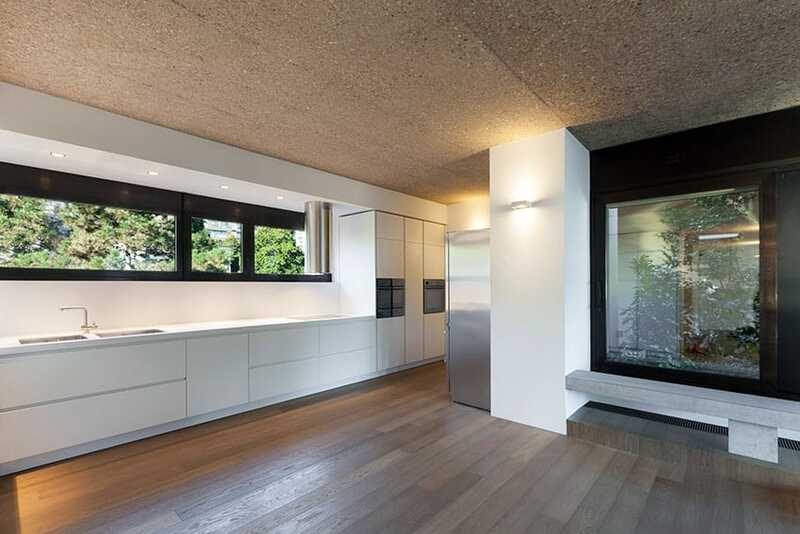 The wide space beside the linear kitchen is decked in concrete ceilings and wood plank flooring and features an unfinished minimalist-style concrete bench. This modern luxe kitchens features a back wall of floor to ceiling glossy white kitchen cabinets with no surface hardware. 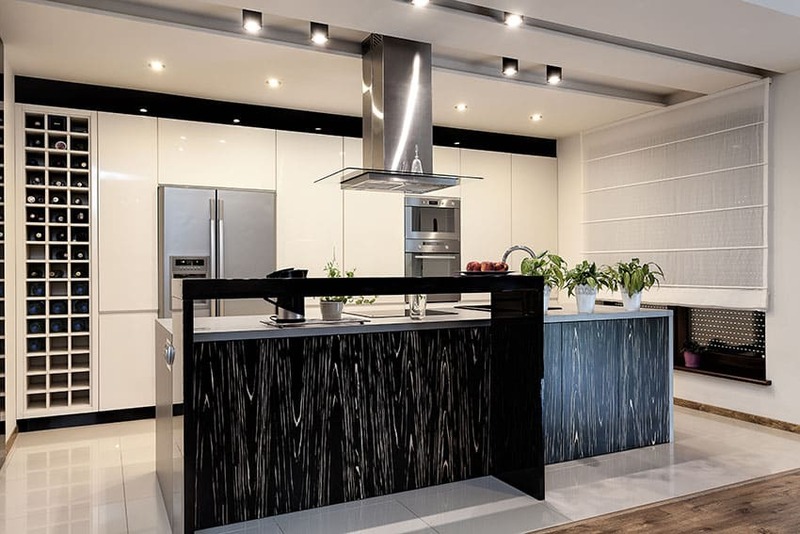 The lower and upper trims of this back wall feature glossy black flat profile trims that match with the glossy black tall bench attached to the kitchen island. The grey stone countertop is complemented by the stylistic wooden front laminate whose eccentric pattern contrasts with the plain white porcelain tile flooring. 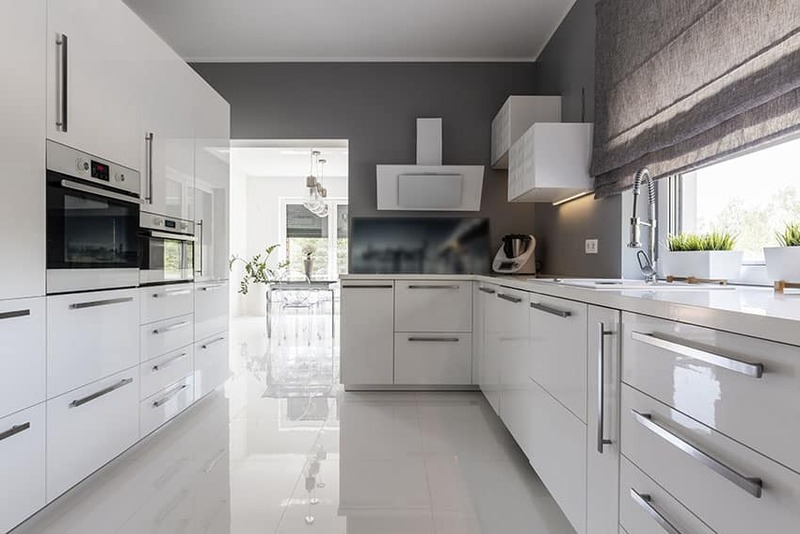 Modern white kitchen design ideas for spaces with little natural light often opt for bright white high gloss cabinets and countertops to help reflect light and brighten the space. This modern kitchen closed-off from the rest of the house feature white glossy cabinets and drawers with wide horizontal pull handles and stainless steel equipment embedded into the casework. The gloss and lightness of the cabinets match the polished porcelain tile flooring but contrast with the matte grey walls and grey curtain over the wash basin. Get more modern kitchen ideas on our gallery page.